Joseph Fallert, brewer, was first listed in the 1876 Brooklyn City Directory with a home address at 248 Meserole Street. By 1880 he was listed individually at his long time plant location at 66 (52-66) Meserole Street. This is in general agreement with early 1910’s Fallert advertisements that indicate that the business was established in 1878. Fallert was listed this way through 1887. In the 1889 Directory the listing changed to “Joseph F Fallert Brewing Co., Ltd. At this point the business listed both an office address of 86 Lorimer Street and plant address of 60 Meserole Street. In the 1904 Directory, the office location moved to 346 Lorimer Street. This rendering of the Fallert plant appeared in a publication called “Bushwick and Her Neighbors, Vol 2,” published in 1909. The Joseph Fallert Brewing Co., Brooklyn N. Y. hereby announces that they have adopted and registered labels on their arrow-brand “Alt-Bayerisch,” “Standard” and “Superb” Beer. Newspaper advertisements for them began appearing as early as December of 1896. This advertisement that appeared in the January 30, 1897 edition of the New York Tribune appears introductory in nature, suggesting that they began bottling them at around that time. A dark beer especially brewed and bottled for family use where a strengthening and healthy beverage is necessary. It’s a food. Later, in the mid-teens, they advertised a bock beer as well. Mr. Fallert was born in Brooklyn and educated in the Brooklyn public schools. He went abroad as a young man and studied the brewing business, and following the death of his father, Joseph Fallert, many years ago, succeeded him as president of the Fallert Brewery, to which he devoted all his business lifetime. He was a practical brewer himself and personally supervised all the workings of the establishment. The 1913 – 1914 Copartnership and Corporation Directory of Brooklyn and Queens listed Joseph Fallert Pres, Bertold Fallert VP & Sec and Charles Fallert Tres. By this time, I assume that Fallert Jr. is the president. He continued serving as president of the company until his death in 1919. It’s not clear if the business continued to operate during and after National Prohibition. 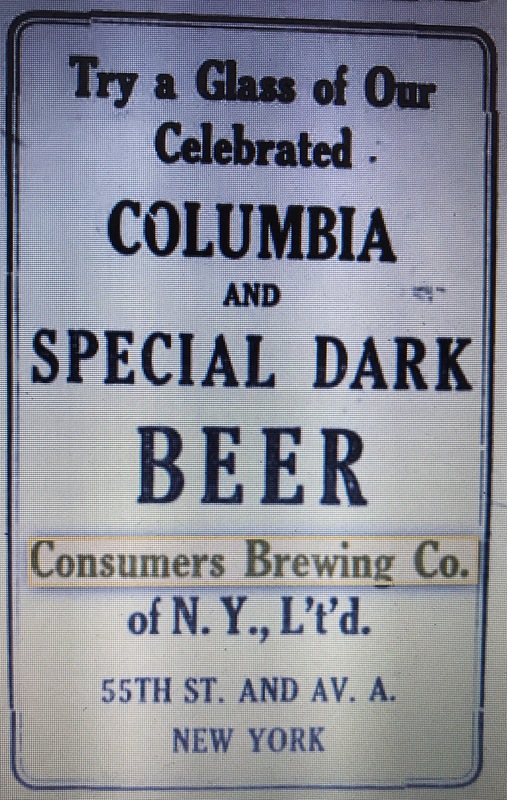 The business was listed in the 1922 Copartnership and Corporation Directory of Brooklyn and Queens and continued to be listed as the Joseph Fallert Brewing Company at the 346 Lorimer Street office location through the late 1930’s. After Prohibition, in the classifieds (today’s yellow pages) for 1935 and 1936 they were listed under beverages even though classifications such as beer, beer gardens, brewers or bottlers were available. In the 1940’s they were still listed in the general phone books at the same address but dropped the word “Brewing” from the company name. By 1950 I don’t see them listed at all. 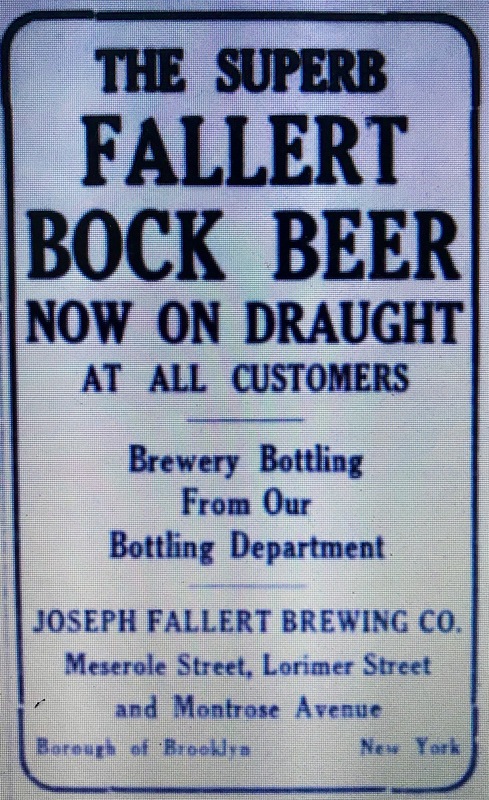 I should note that I haven’t been able to find any Fallert advertisements during or after Prohibition so it appears they may have been operating in name only. Prior to Prohibition they advertised quite a bit. It appears that several buildings associated with the brewery are still standing including the offices at 346 Lorimer Street. 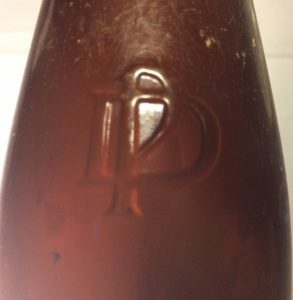 I found two champagne style 12 oz Joseph Fallert Brewing Co. Ltd bottles each with the trademark Arrow embossed on it. One is a tooled blob, the other a tooled crown. Both were manufactured no earlier than 1896, recognizing that that’s when Fallert began bottling the brand. The blob probably dates to the late 1800’s – early 1900’s and the crown early 1900’s. 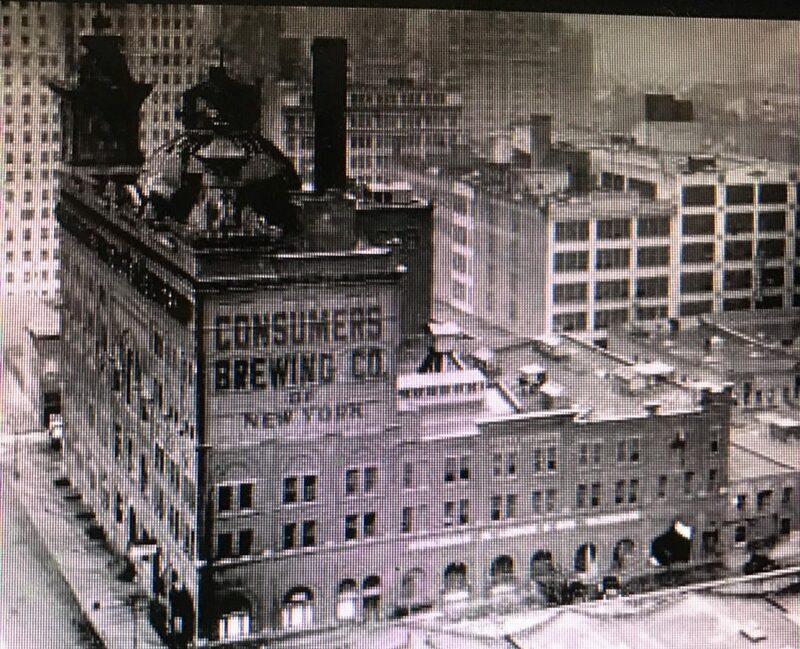 The driving force behind the Excelsior Brewing Company was John Reisenweber who was the owner of a restaurant called “Reisenweber’s at the Circle.” Located at Columbus Circle, it was one of the oldest and most popular New York City restaurants at the time. His entry into the brewing business and the early history of the brewery was described in a section of the Staunton (Va.) Daily Leader entitled “Industry and Commerce” published on May 23, 1908. Scores of New York’s prominent citizens and many thousands whose frames are not enrolled in any Hall of Fame have quaffed the foaming steins of beer dispensed at the popular hostelry and restaurant of mine host John Reisenweber at Columbus Circle, but few of them are aware, perhaps, that the grateful beverage served there has been brewed under the vigilant eye of the genial hotel man himself. 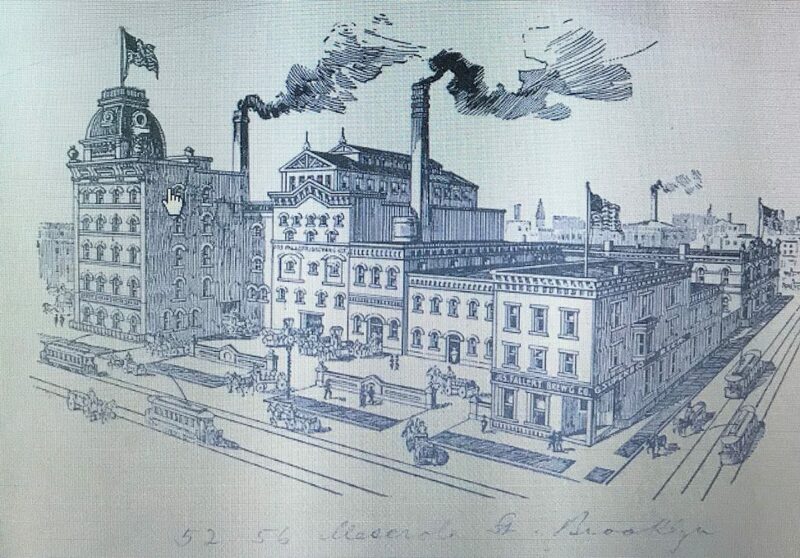 To them it will be interesting to learn that Mr. Reisenweber is the president and active head of the Excelsior Brewing Company, whose large plant at Hart and Pulaski Streets, Brooklyn, N.Y., is a worthy example of a large industry. Casting about them for a suitable site, they learned that the Hower plant was in the market, bought it, and on the 16th of May, 1898, took possession. The new owners almost immediately took steps to remodel the then small brewery. They built extensive additions, including new cellars, which increased the storage capacity from 75,000 barrels to 150,000 barrels, and installed a new 75-ton refrigerating machine and complete set of new boilers. 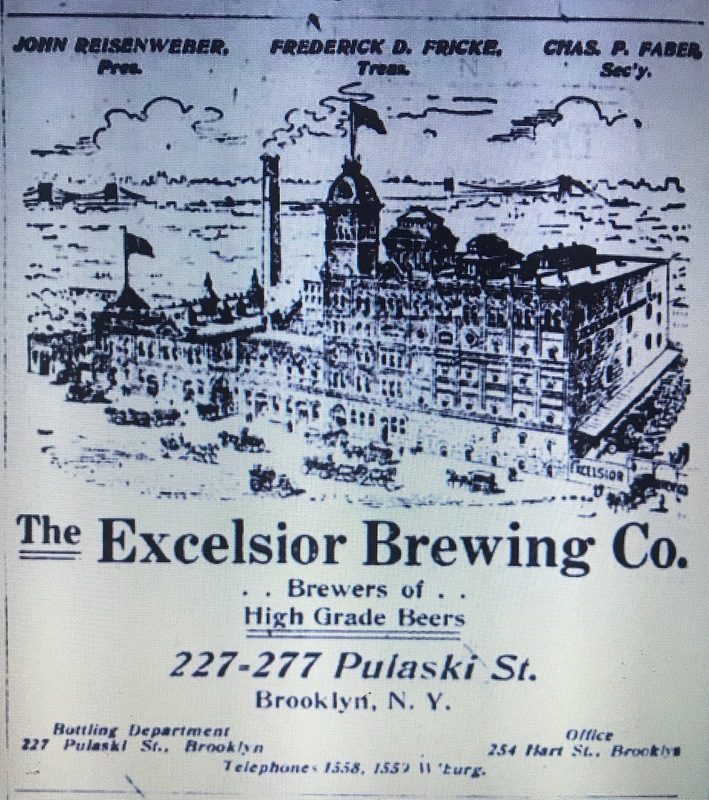 As a result of these extensive alterations, which cost $200,000, the Excelsior Brewery today is second to none in New York in point of modern equipment, and ranks among the largest in point of capacity and output. The buildings, which are fireproof, are up to date in every detail. The company owns a plot equal to 33 city lots, having a frontage of 700 feet on Pulaski Street and running through to Hart Street. The output, which was only 20,000 barrels in 1895, was gradually increased to 160,000 barrels last year. To operate the brewery requires over eighty employees, while 95 horses, 38 wagons and 2 electric trucks are required for the distribution of the output. This output, besides having many consumers in Greater New York, is shipped to points on Long Island, in New Jersey and Connecticut. The value of the plant has practically trebled and it is today worth about $1,500,000. Four grades of beer are brewed – Real German Lager, Pilsner Bohemian and Wurzburger. In quality they are equal to the best imported product and their popularity is attested by the strong and growing demand for them. The officers of the company are John Reisenweber, President; Franz Neumuller, Vice President; Frederick Frick, Treasurer, and Charles P. Faber, Secretary. 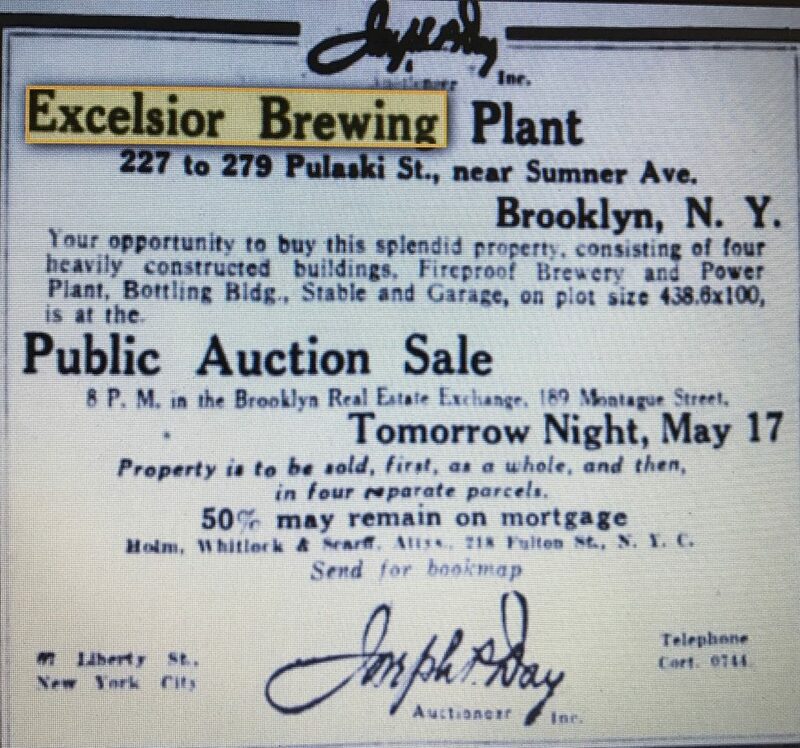 The newly organized Excelsior Brewing Co of Brooklyn NY was opened on July 31, 1898. Some German singing societies were invited among others who helped entertain the visitors by a number of songs. The favor accorded to the new brew must have given John Knoll, the brew-master, intense satisfaction. The guests were received by Franz Neumueller, the first vice president and Ernst Distler, the superintendent. An advertisement published in March of 1909, provided an overall picture of the plant less than a year after the feature was written. 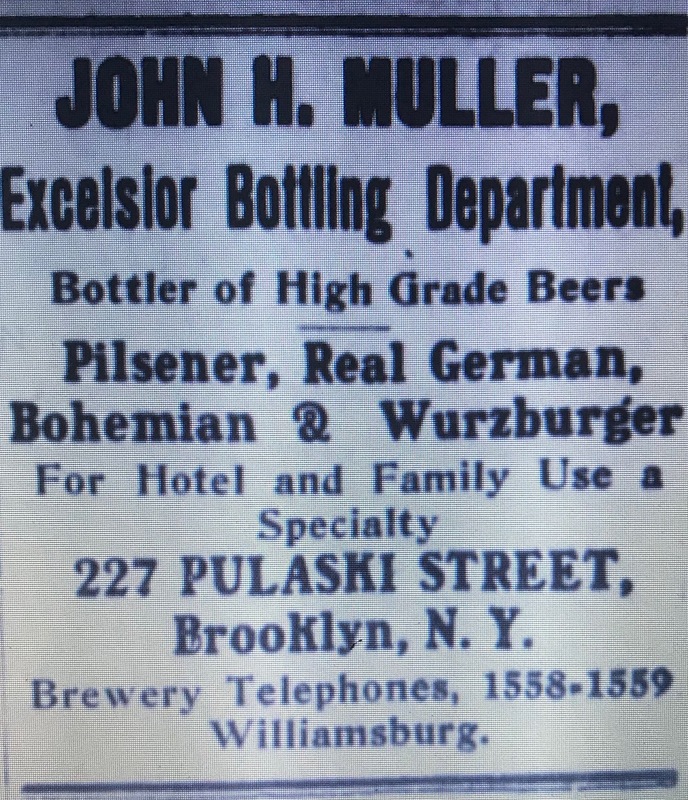 The Bottling Department of the brewery was apparently run by John H Muller. His name appears on an October 5, 1907 advertisement that touted the same four beers mentioned in the 1908 feature: Pilsner, Real German, Bohemian and Wurzburger. The 1913-1914 Copartnership and Corporation Directory of the Boroughs of Brooklyn and Queens continued to list John Reisenweber Pres, Frederick D Fricke Tres and Charles P Faber Sec. Frick was an old time New York hotel man who owned Earle’s Hotel on Waverly Place. Faber, also in the hotel business, was a director of the Dollar Savings Bank. A June 21, 1921 article in the “Beverage Journal” provided a review of brewery activities (during prohibition) that stated that the Excelsior Brewery was operating a cold storage plant and was producing cereal beverages. In May 1923 the plant apparently closed and was sold at public auction. The dissolution of the Excelsior Brewing Company, 254 Hart St., another victim of the Volstead law, will be completed by August 15, as the result of an order signed today by Justice Callaghan, setting that date as a limit for the filing of any claims against the defunct corporation. The certificate of dissolution was filed today in the County Clerk’s office and the petition to Justice Callaghan by John Reisenweber, who was president of the corporation, states that all of the presented claims have been paid. Four years later the plant was operational again producing a “near” beer called “OLDe KEG” under the name of Excelsior Brewery, Inc. While Olde Keg may have been “Within the Law,” other beverages being produced by the brewery in the late 1920’s apparently were not. On August 8,1930, the current reputed owner, Charles I. Mandel, was arrested and the brewery seized for violation of the prohibition law. This followed a seizure the day before of equipment for bottling and distributing beer in a garage on DeKalb Avenue, a block away. The prohibition agents contended that they traced a pipeline through an old sewer trench from the garage into the brewery. Later the arrest and seizure were voided on the grounds that the federal agents failed to obtain a search warrant prior to invading the premises. Nonetheless, the brewery was seized again in August of 1931. This seizure was also set aside even though 35,000 gallons of beer were found on the premises. It was ruled that the search warrant was obtained on insufficient evidence. In 1932, the plant was sold to a group of Manhattan purchasers headed by Samuel Rosoff, a contractor and subway builder. It operated as the Kings Brewery from 1932 to 1938 when it was closed after an attempted reorganization in 1937. A community school is currently located at the former brewery location. I have three bottles from this business. One is a champagne style tooled blob embossed Excelsior Bottling Dept that probably goes back to the beginning of the Reisenweber ownership. 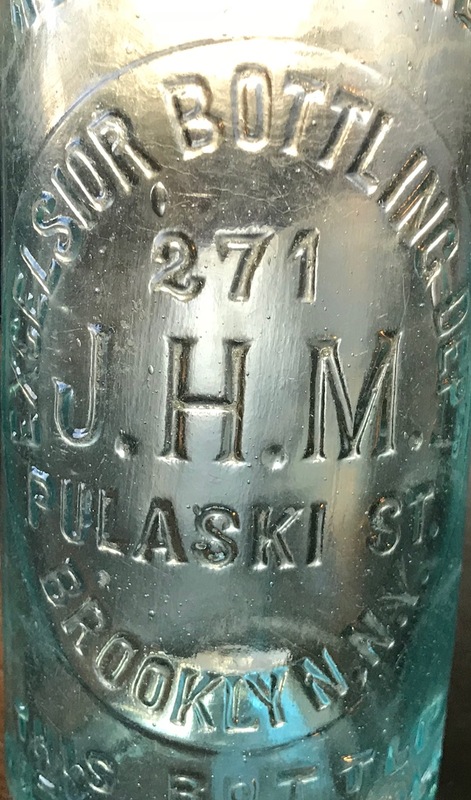 The bottle also has the initials JHM embossed on it which stand for John H Muller. 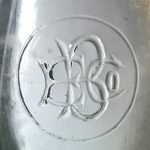 The two other bottles are champagne style tooled crowns from 1900-1910. It appears that John Eilenberg, and later his son Henry M Eilenberg, operated a wholesale liquor business on S Main St in Phillipsburg NJ. According to his obituary, published in the December 29, 1922 issue of the Plainfield Courier News, John Eilenberg was a long time resident of Phillipsburg. Mr. Eilenberg was born in Sussex County and went to the schools there. He started to work as a telegraph operator for the Central Railroad of New Jersey. He moved from Philadelphia to Phillipsburg in 1860, and has lived there since. He was a wholesale liquor dealer until twenty-one years ago. He was one of the oldest active building and loan officials, having been for fifty-one years secretary of the Building and Loan Association No. 5 of Phillipsburg. He held the position until his death. As president of the town council and a member of that body for a number of years Mr. Eilenberg was identified with many activities here. Eilenberg listed his occupation as “attend liquor store” in the 1880 census records, so the business extended back at least that far, however, its possible that it goes back even further. In 1870, census records listed his occupation as a merchant and the 1873 Phillipsburg Directory listed his occupation as a clerk, so a start in the 1860’s is not out of the question. Based on the directory information that I could find the business was located at 533 South Main up until at least 1894. One directory, “The Warren County History and Directory or the Farmer’s Manual and Business Men’s Guide – 1886” contained a printed advertisement. Sometime between 1894 and 1898 the business moved to 362 South Main. In the 1906 and 1908 Directories, John’s son, Henry M Eilenberg was listed as a wholesale liquor dealer at the same location. Presumably Henry took over the business in 1901 if the information in the obituary is correct. Around this time an item in a local publication referred to the business as: H M Eilenberg, Bartholomay’s Beer, S Main St in Phillipsburg. Based on this it looks like the business served as the beer company’s local agent and bottler for a while. In the 1910 directory, the business was no longer mentioned and Henry’s occupation was listed as a machinist. The 525 S Main Street address is currently a vacant lot. 362 South Main is an older three story apartment building with commercial stores at street level and could date back to the business. 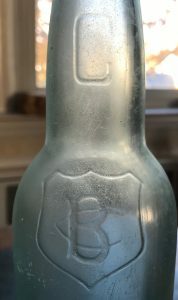 The bottle I found is 8 oz and embossed “H.M. Eilenberg. It looks like a soda water although I guess it could have contained Bartholomay beer. It’s a tooled crown so it fits within the time frame that John’s son Henry ran the business. 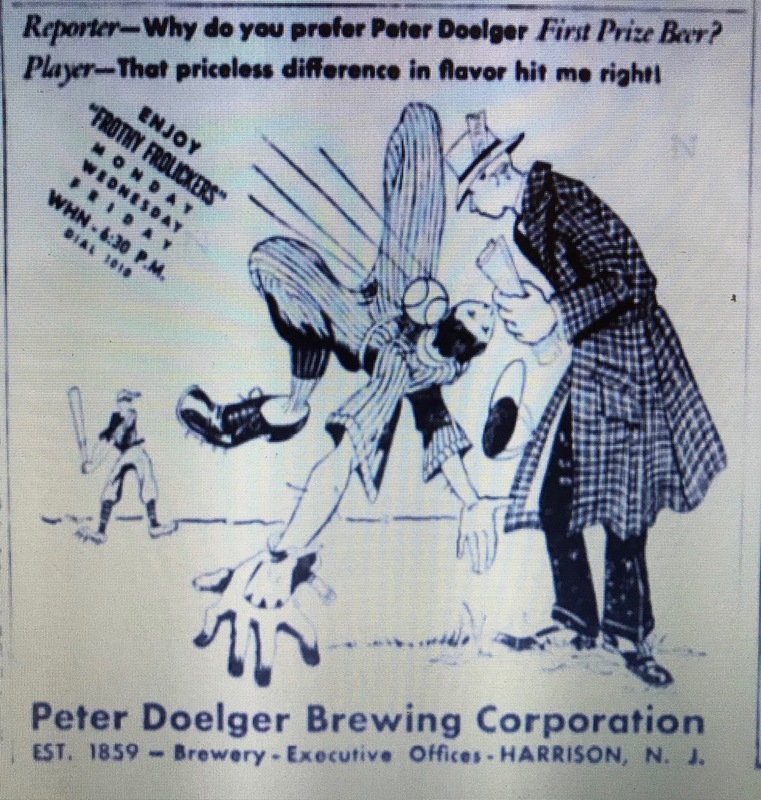 Peter Doelger’s obituary, published in the December 16, 1912 issue of the New York Tribune, provides some information on his life and the early years of his brewery. Mr. Doelger was born at Kleinwallstadt, in the province of Oberfranken, Bavaria, on March 3, 1832. His father conducted in the village a small but prosperous brewery, in which he made a dark brown beer whose fame spread beyond the province. Peter Doelger was one of six children all of whom learned the trade in their father’s brewery. In 1850 Mr. Doelger came to New York to join his brother, Joseph, who proceeded him by two years. The following year Mr. Doelger went to Savannah, but with his brother soon returned to this city and started a brewery in 2d Street between Avenue A and Avenue B. In 1859 Peter started a brewery for himself, and the same year married Miss Margarethe Lambrecht. 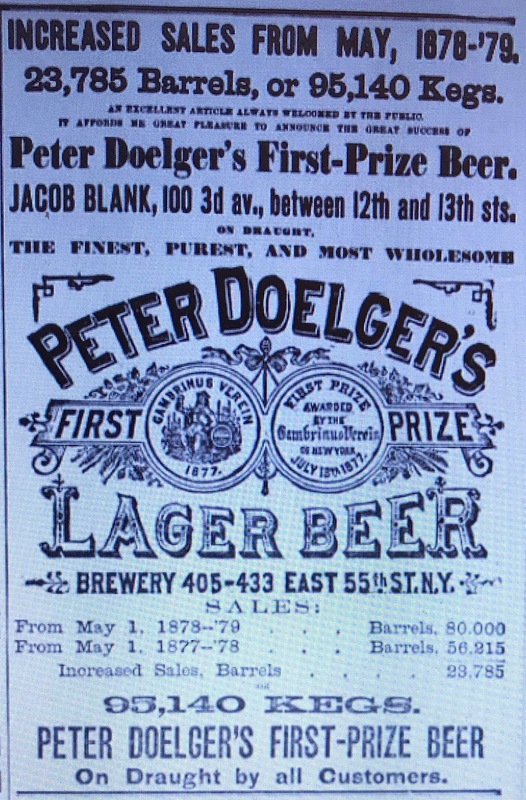 There being very few breweries in the city at that time, the one operated by Peter Doelger grew amazingly, his beer becoming so popular that in 1863 it was necessary for him to purchase four lots in East 55th Street, between First Avenue and Avenue A. Today there stands the big brewery that embraces the entire block between 55th and 56th Streets, First Avenue and Avenue A. It is said to be one of the most modern breweries in the country. The early New York City directories generally confirm the above information. In the mid 1850’s, Joseph Doelger is listed as a brewer at 156 3rd St (not 2nd St). 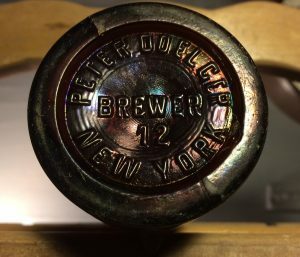 In 1859 Peter Doelger is listed for the first time as brewer at 93 Avenue A. Between 1860 and 1863, the business of Doelger and Schaefer, brewers, was listed with two addresses: 98 Avenue A and East 55th Street, near Avenue A. 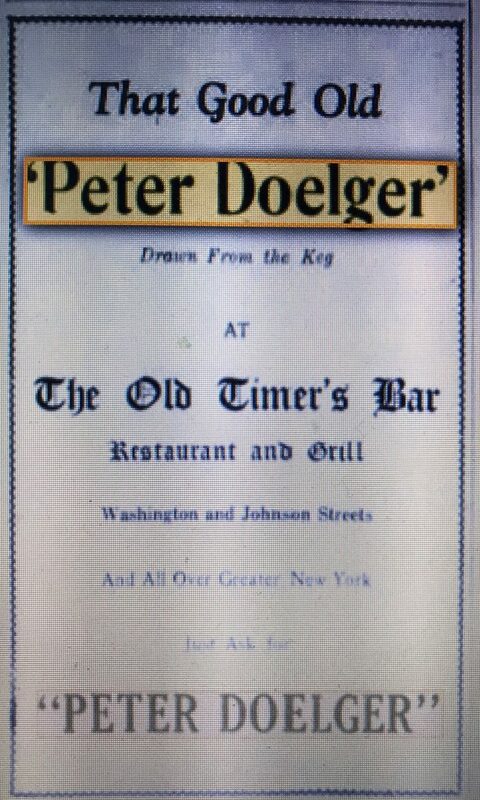 By 1865, the Doelger and Schaefer name was gone and Peter Doelger, brewer, was listed at East 55th Street where it remained until the late 1920’s. After his death, his sons Peter Jr. and Charles continued to run the business. Around this time, it appears that the business was also incorporated. 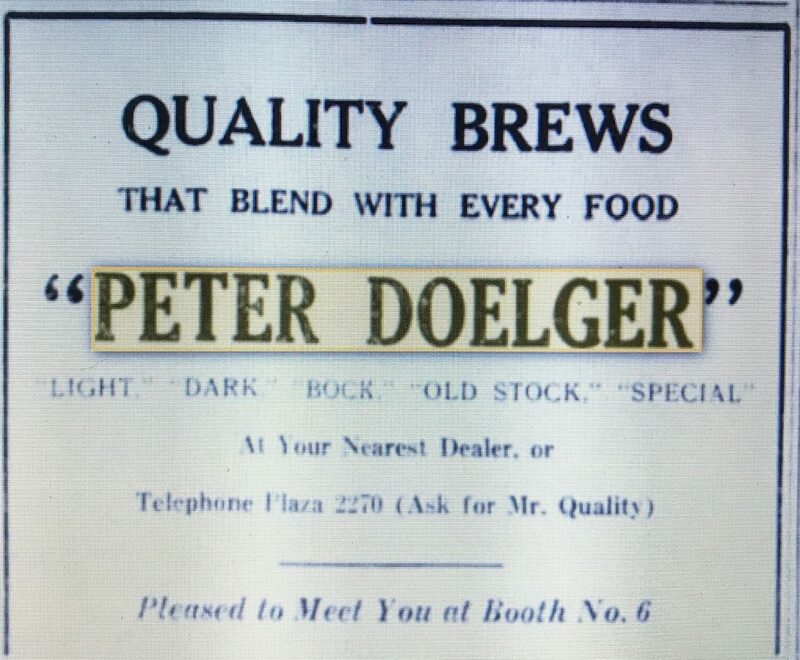 The 1914 Copartnership and Corporation Directory lists the business as the Peter Doelger Brewing Co., Inc., located at 407 E 55th Street. Peter Jr. was named president and Charles was secretary. 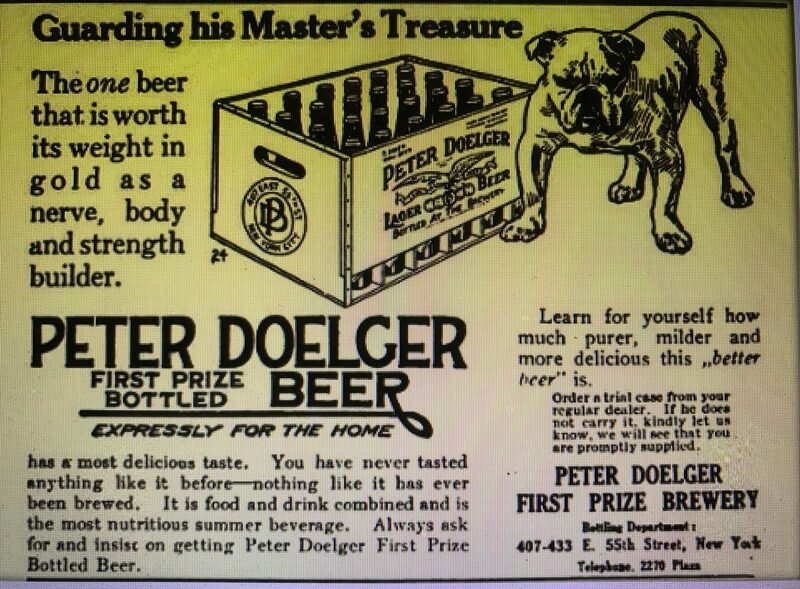 Doelger referred to his brewery as Peter Doelger’s First Prize Brewery and his beer was called Peter Doelger’s First Prize Beer. An 1879 advertisement compares sales in 1877 – 78 to 1878 – 79. With the scraping of trowels and the clanking of hammers barely stilled, the most scientifically equipped and sanitarily perfect bottling plant in the world stands ready for the push of the electric button which will set its wonderful machinery in motion. 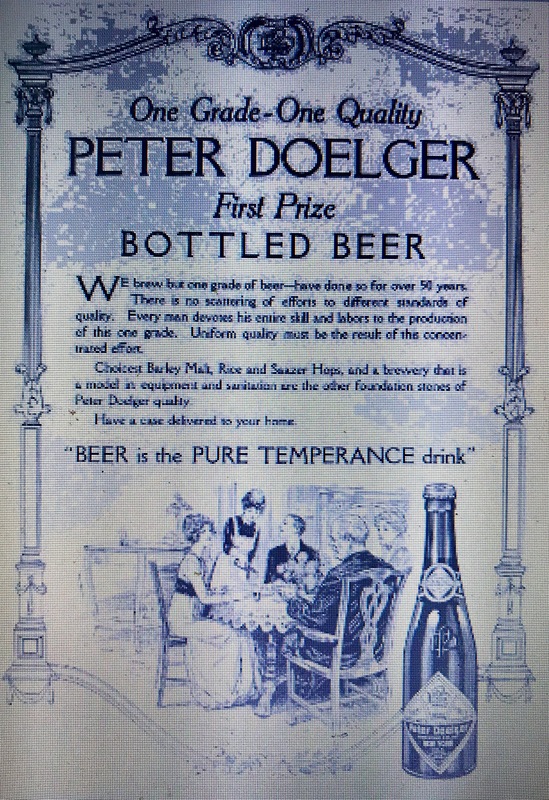 For more than half a century, Peter Doelger First Prize Beer has held undisputed supremacy over all other brews. Since 1859 this healthful liquid food has been drawn directly from the barrel to delight the palate of the connoisseur. Today, thanks to the unceasing efforts of our experts, aided by the remarkable advance of science, Peter Doelger First Prize Beer will for the fist time be sold to you in bottles; a worthy tribute to the brewers and bottlers highest art. Another advertisement, this one in 1916, now called it “First Prize Bottled Beer” and touted it as “The one beer that is worth it’s weight in gold as a nerve, body and strength builder. Brooklyn Daily Eagle advertisements from March 9, 1924 and August 8, 1926 demonstrate that they were brewing near-beer under the Doelger name during Prohibition. Sometime in the late 1920’s The business sold the East 56th Street brewery and moved to Brooklyn. A September 1, 1929 article in the Brooklyn Daily Eagle referenced the Doelger Brewery in an article that discussed the trend of old brewery sites on Manhattan’s east side being replaced with apartment buildings. 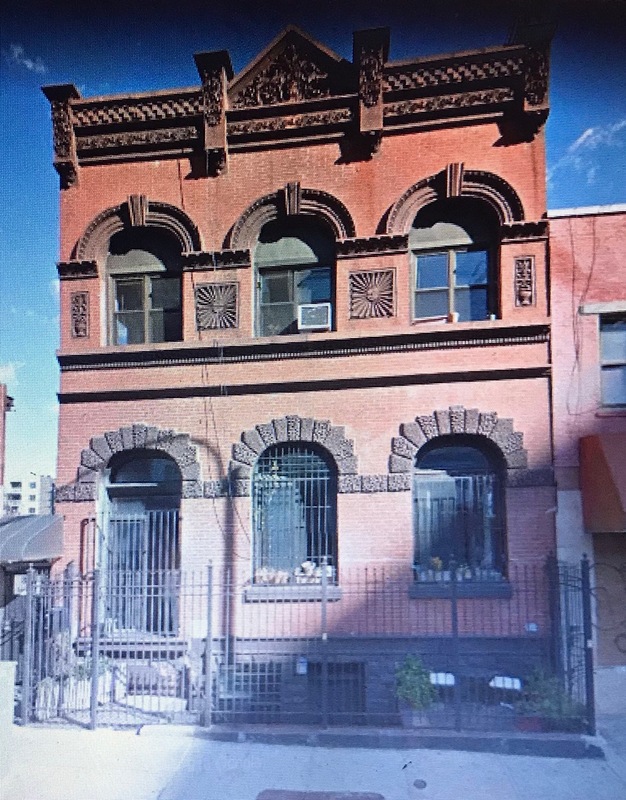 The Doelger brewery property is on the block bounded by Sutton, 1st Ave., 55th and 56th Sts., held at $5,500,000 and is reported to be sold to builders for re-improvement with fine apartment houses. The site is 200×613. Around this time, the business moved to Monteith Street and Evergreen Avenue in Brooklyn then, in 1936, they leased the Hauch Brewery in Harrison NJ. The Harrison N.J. location was included on this 1937 advertisement. The brewery closed in 1947 or 1948. An item in the April 13, 1948 issue of the Plainfield Courier News declared the business bankrupt. Federal Judge Thomas F. Meaney yesterday declared the Peter Doelger Brewing Corporation of Harrison bankrupt and ordered it liquidated. The bottle I found is machine made and dates no earlier than 1911 when their bottling plant opened. It matches the bottle shown in this 1916 advertisement. Peter had a brother Joseph whose family also operated a brewery on 55th Street at 234 East 55th Street. The brewery was originally listed in the directories under Joseph Doelger (1904 and earlier) and later under Joseph Doelger’s Sons (1907 and later). The history of Beadleston And Worez is best told in the obituary of Alfred N Beadleston who died suddenly while on vacation in 1917. At the time, he was serving as president of the company. I found the obituary in the January-June 1917 Issue of the ‘Western Brewer and Journal of Barley Malt and Hop Trades”. Excerpts relating to company history are presented in the following paragraphs. Beadleston and Woerz was the outgrowth of the small brewing business started in Troy NY in 1825 by Abraham Nash, called Nash and Co. In 1837, Ebenezer Beadleston, a relative of Nash living in Troy moved to NYC to serve as the company’s NYC representative. Three years later in 1840 the company became known as Nash, Beadleston and Company. In 1845 they purchased the old state prison property in NYC bounded by Washington, Charles, West and W 10th The prison had been first occupied in 1797 but upon completion of Sing-Sing in 1828 the convicts were removed to the more modern establishment. The site was in what was then called the Village of Greenwich (now called Greenwich Village) and the substantial stone buildings were fitted up for brewing and malting purposes. The plant was put into operation as the Empire Brewery. Until 1856 the Troy and NYC businesses were operated jointly, NYC as a branch of the Troy brewery. In 1860 Nash retired and was succeeded by W. W. Price an employee of the business. In that year Ernest G.W. Woerz took charge of the practical and technical part of the business. 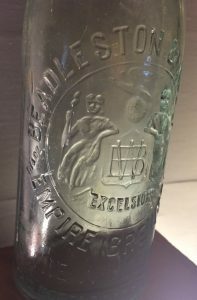 Ebenezer Beadleston retired from active participation in the business in 1865 and the firm name became Beadleston, Price and Woerz, the members being Ebenezer Beadleston, W.W. Price, Alfred N Beadleston (Ebenezer’s son) and E.G.W. Woerz. Price died in 1876 and in 1878 the firm name was changed to Beadleston and Woerz. Around this time they upgraded the plant, building a new and larger brewery building (some of the existing prison walls were incorporated into the new building). The business was incorporated under the Beadleston and Woerz name in 1889 and Alfred N Beadleston served as president until his death in 1917. 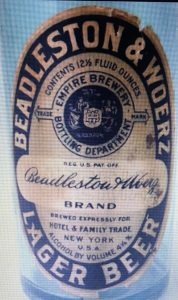 In 1879, Beadleston and Woerz was the 14th largest brewery in the United States producing 78,000 barrels. 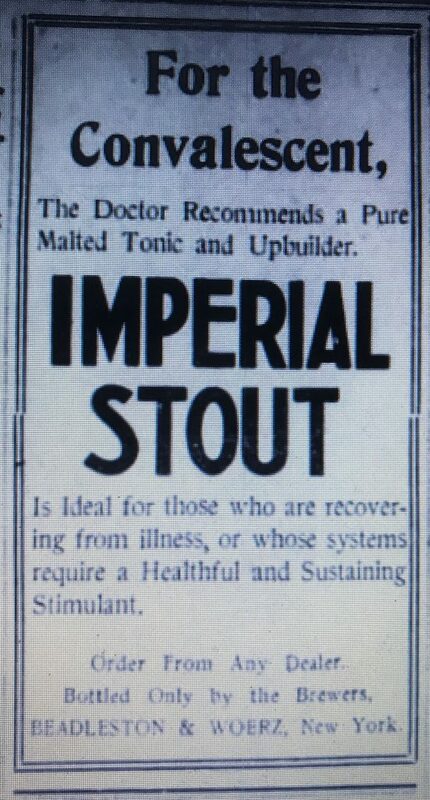 Physicians predict increase of popularity of the “Imperial Beer” and “Culbacher” which they commend for purity. 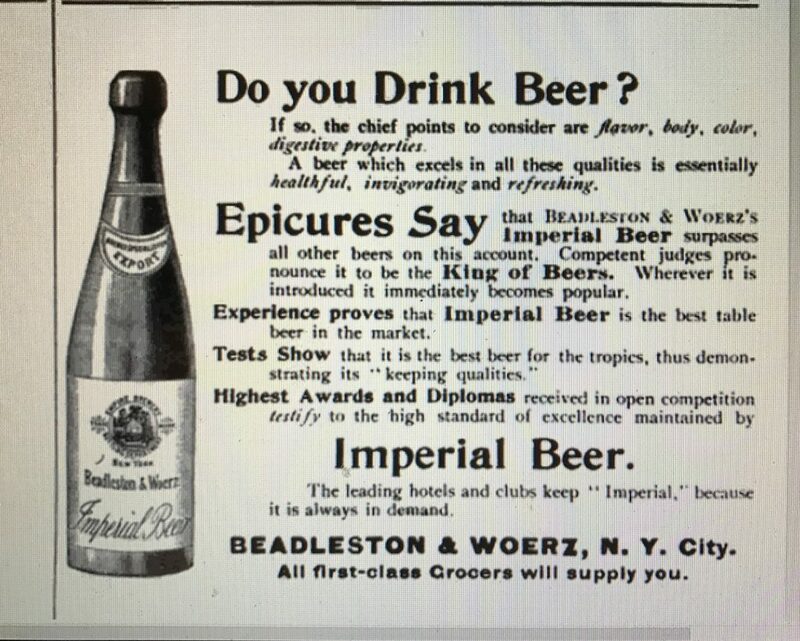 Advertisements for Bradleston and Woertz’s Imperial Beer appear in several 1894 magazine issues including Puck Magazine and Life Magazine. They claim it to be the King of Beers (long before Budweiser). They apparently sold a number of different beers under their “Imperial” Label. One called “Imperial German Brew” was introduced as a new brand in 1897. A printed notice in the May 25, 1897 issue of the Brooklyn Daily Eagle described the new product. Old Fashioned German Beer – Popular taste, like fashion, shows a pronounced tendency nowadays to return to the good old customs and enjoyments of our forefathers. This is particularly noticeable among customers of lager beer, who as a class, are showing preference, akin to an affection, for the old-fashioned German brewing. To gratify this growing demand Beadleston & Woerz, of New York, one of the largest breweries in the United States, have just introduced a new brand called Imperial German Brew, in which, by their strict adherence to malt and hops, exclusively, for the ingredients, the purity, flavor, color and body of the old-fashioned lager beer is reproduced to a degree of perfection that makes it identical to the product of fifty years ago. For the purposes of giving an immediate opportunity to persons desiring to try it Beadleston & Woerz will deliver it direct from the brewery, 291 West Tenth St., New York. An recent archeological study done for the brewery site states that Prohibition shut the plant down permanently in 1920 but the business transitioned into real estate because of all the properties they owned. Apparently they didn’t waste much time. The December 16, 1920 edition of the New York Tribune contained the following story. A large section of the Beadleston & Woerz Empire Brewery property, a landmark at 158-166 Charles Street, has been leased to the Reynolds Whitney Warehouse Co., Inc., for twenty years at an aggregate rental of $600,000. The warehouse company also secured an option to lease the buildings at 674 and 676 Washington Street and 287-303 West Tenth Street. I’ve found two bottles, both tooled crowns probably in the 1900 to 1910 range. I’ve seen similar bottles on the Internet with their labels still present. 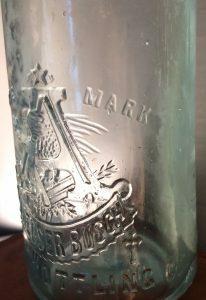 The company started on June 7, 1897 when the Thimig Bottling Company officially changed it’s name to the A Busch Bottling Company. 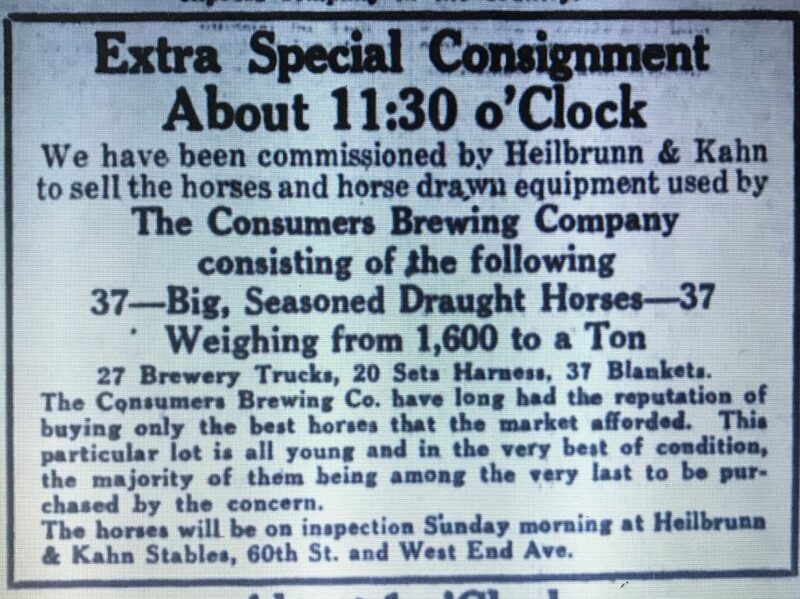 I have to assume that Anheuser-Busch had purchased Thimig around that time. A notice announcing the proposed name change was printed in the May 5, 1897 issue of the Brooklyn Daily Eagle. 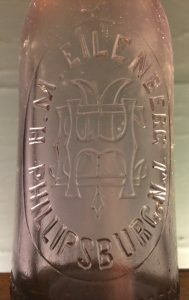 Prior to that, Anheuser-Busch had used local distributors to bottle and sell their product in New York and the Thimig Bottling Company was one of those distributors. 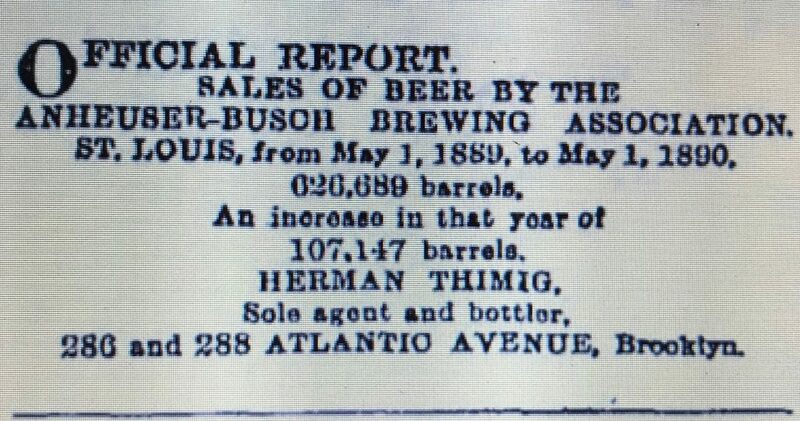 Thimig’s relationship with Anheuser-Busch dated back to at least 1884. 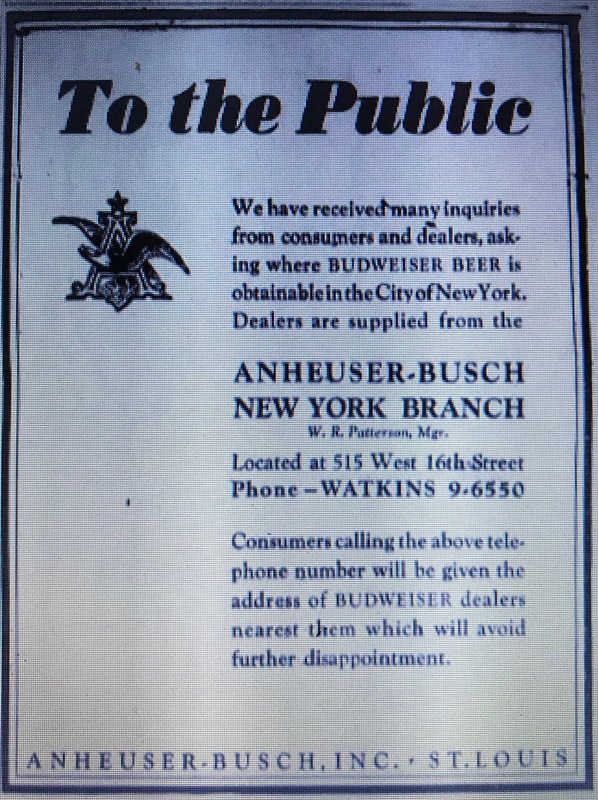 An advertisement that year in the April 26 issue of the Brooklyn Daily Eagle listed Anheuser-Busch as one of the beers they sold on draught and in bottles. 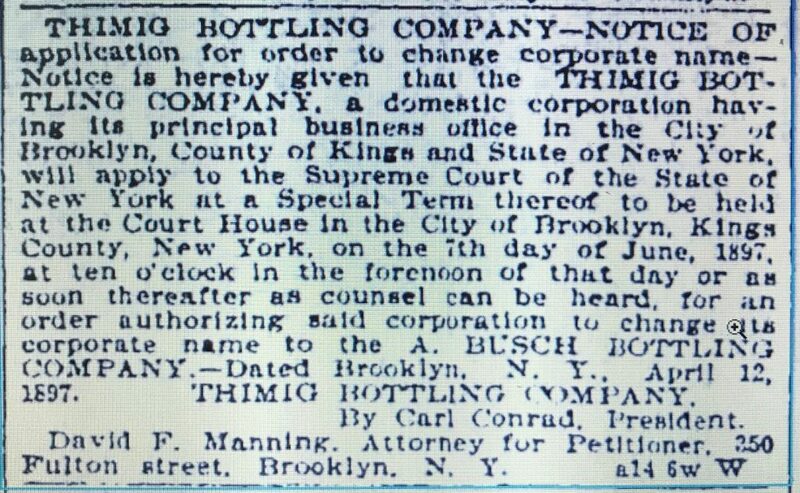 Then in a May 18, 1890 advertisement Thimig was named as their sole agent and bottler (I assume for the City of Brooklyn). 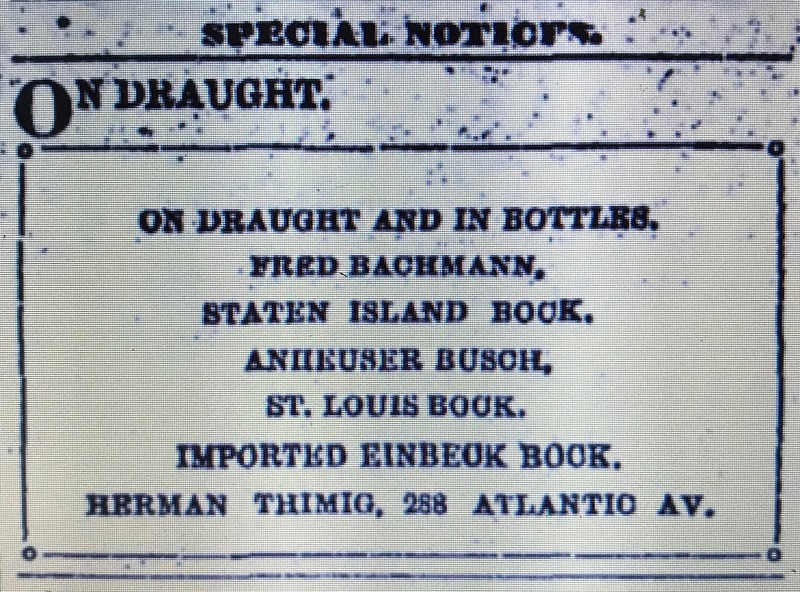 Herman Thimig was first listed in the Brooklyn directory in 1871 as a bottler on Atlantic Avenue. He had several Atlantic Avenue addresses: 276 Atlantic (1871); 288 Atlantic (1875 to 1889) and finally 433-435 Atlantic (1892 to 1897). He also maintained a 50 Bergen Street address for a while as well. The first mention of the A Busch Bottling Co in the NYC Directories that I could find was in the 1899 Trow Business Directory of Brooklyn at 433-435 Atlantic Avenue, the former address of the Thimig Bottling Company. A year prior, Alfred Busch was listed in the 1898 General Directory at that address. The A Busch Bottling Co continued to be listed in all of the Brooklyn City Directories and Telephone Directories I could find between 1902 and 1917 at 433-435 Atlantic Avenue. The 1913-1914 Copartnership and Corporation Directory for Brooklyn and Queens listed the Business as a NY Corporation with E A Faust as President; J Alfred Piper as Vice Pesident and H P Hof as Secretary and Treasurer. Around the time the A Busch Bottling Company was established they were bottling several different Anheuser-Busch brands. 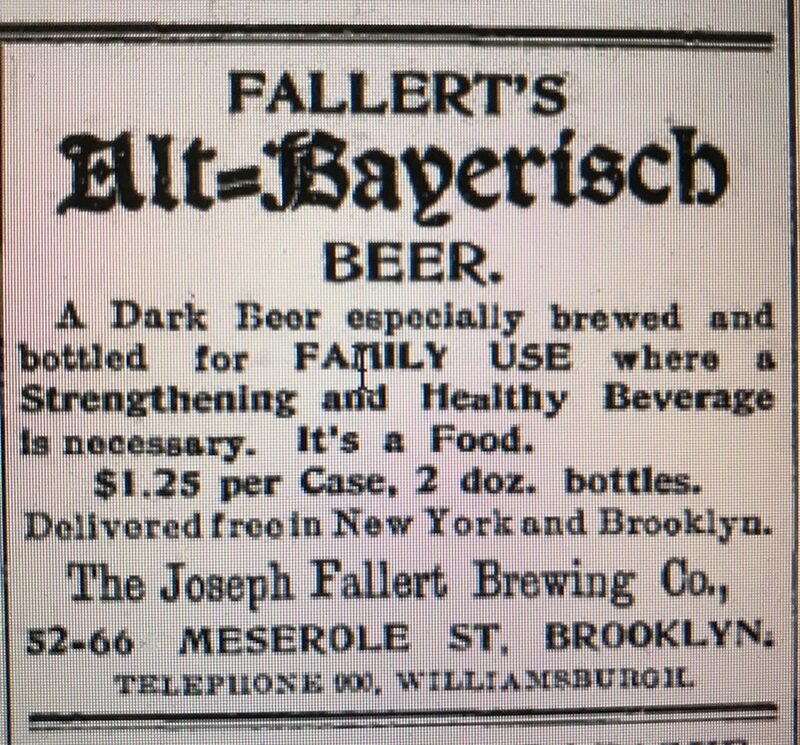 An advertising item in the October 11, 1900 issue of the Brooklyn Daily Eagle named them as wholesale dealers for the following bottled beers: Budweiser, Faust, Black & Tan, Anheuser Standard, Export Pale, Exquisite and Pale Lager. Other advertisements in that time frame mentioned Michelob as well. 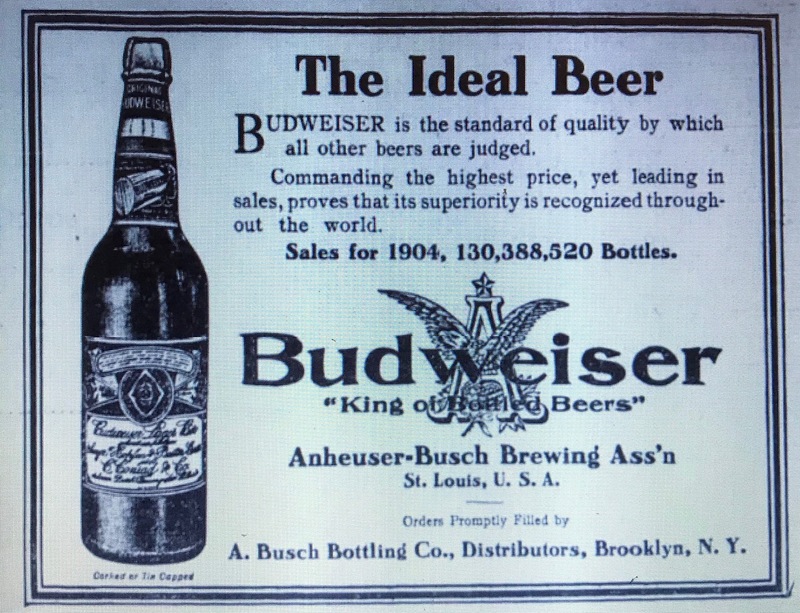 During the early 1900’s, Anheuser-Busch and primarily the Budweiser brand was growing leaps and bounds. 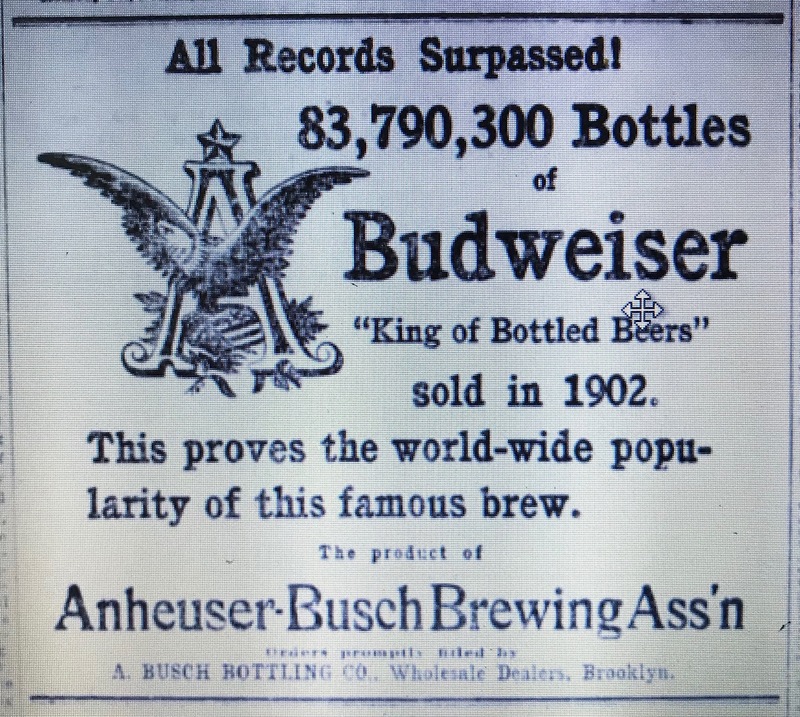 This growth was documented by A Busch Bottling Company advertisements that indicated that Budweiser sales went from 83 million bottles in 1902 to 130 million bottles in 1904. 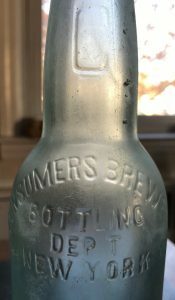 From their inception, up through 1905, the A Busch Bottling Co. was the only wholesale distributor in the NYC vicinity I’ve seen listed with Anheuser-Busch products but by then it appears that they could no longer handle the growing local demand. 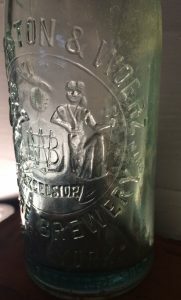 In 1906, the Anheuser-Busch Agency located in New York City was listed in the advertisements as a second distributor and by 1909 the Anheuser-Busch Newark Agency was listed as a distributor as well. The A Busch Bottling Company was not listed in the 1922 Copartnership and Corporation Directory for Brooklyn and Queens so it appears that they did not survive even the beginning of National Prohibition. 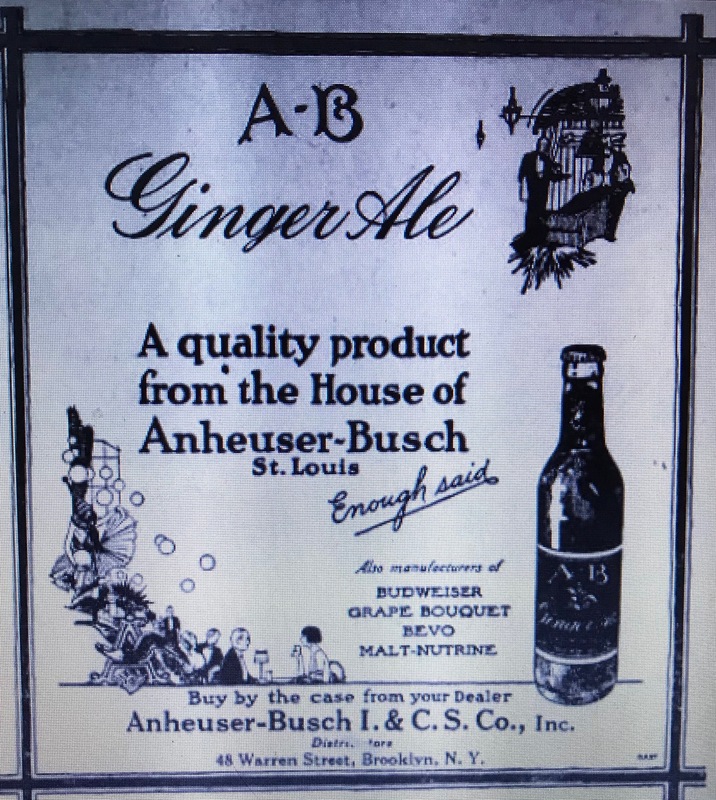 Anheuser-Busch was still marketing products in New York at that time, including a tonic version of Budweiser and Anheuser Busch Ginger Ale, but in early 1920’s advertisements they listed the Anheuser-Busch Ice & Cold Storage Co., Inc. as their distributor. An advertisement from July 1, 1924 listed that company’s address as 48 Warren Street in Brooklyn. Other advertisements also listed a 166th Street address in NYC. 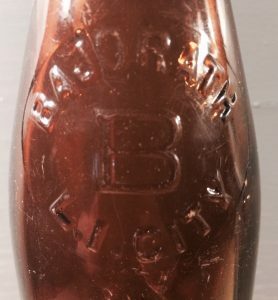 Later, Anheuser-Busch listed Anheuser-Busch Inc. at 515 West 16th Street as their distributor for their “Budweiser Barley Malt Syrup.” that was first marketed in 1926. According to a June 1933 advertisement, that location was serving as the Anheuser Busch-New York Branch when Prohibition ended. Today, 433 to 443 Atlantic Avenue is a series of renovated apartment buildings. They don’t appear old enough to be associated with this business but the other side of Atlantic Avenue appears older. I have found two champagne style bottles both with tooled crowns. 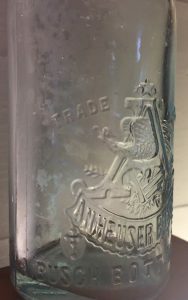 They are embossed with the A Busch Bottling Co. name and the Anheuser Busch trade mark insignia. I’d say they fit within the first half of the 1897 to 1920 time frame of the business.. Author baybottlPosted on October 3, 2016 January 24, 2019 Categories BeerTags Alfred Busch, Anheuser-Busch, Anheuser-Busch Ice& Cold Storage Co., antique bottle, BIM, Budweiser, Malt-Nutrine, Thimig Bottling Co.